The bond markets may be able to do what the Italian electorate has been unable or unwilling to do, get rid of the Italian Prime Minister. Silvio Berlusconi is dragging Italy into catastrophe and as a consequence the rest of Europe along with it. He is firmly entrenched in Palazzo Chigi and has absolutely no intention of leaving, as he would lose his parliamentary immunity with which he has been fending off a seemingly endless stream of court cases against him. Italian electoral law is also in his favour as it is based on party lists, so those wise Italians who voted for his PDL party basically gave him carte blanche to stack parliament with a bunch of unknown people who owe their livelihoods to Berlusconi personally. They are a motley crew: ex-girlfriends, businessmen in odore di mafia and recycled politicians of every political hue. Basically they will vote for him ad infinitum to guarantee their very generous salaries and various associated perks. There have even been accusations of politicians being bought with promises of lucrative positions in government when the numbers in parliament do not add up. Berlusconi cannot be budged even though his approval ratings are now at an all-time low (about 20%). The man who started out as a quaint Italian anomaly, is now a threat to Italy and Europe and the global financial markets. The Italian electorate and the President of the Italian Republic, Giorgio Napolitano, are paralysed by the Constitution. Every time Berlusconi’s coalition seems to waver, there is a confidence vote to test his majority which he always just manages to win by a handful of votes, with some new under-secretaries being created the following day. It makes for a miserable spectacle, but there may now be a new player in domestic Italian politics; the global bond markets. Berlusconi is playing a dangerous game. He wants to revolutionise the Italian economy by liberalising it completely, but he has to make it appear as though the EU forced him to do it, hoping thereby to avoid alienating his electoral base – although this may be entirely academic as he is by no means guaranteed a political future of any sort given his current form. The list of Berlusconi’s sins is too long to enumerate here, but he is clearly a parasite bleeding the Italian state dry for personal gain (and to stay out of jail). However, the Italian electorate and a pathetically compromised opposition party is also to blame for his 17-year-long reign. The opposition PD party couldn’t even oust a Prime Minister accused of being involved in under-aged prostitution – this gives us some indication of the political free ride that Berlusconi is having. He has dismantled democracy in Italy and replaced it with an army of sycophants on the payroll. The government broadcasting network produces a shameful travesty of news services, pumping out blatant propaganda. One would have thought that the threat of national bankruptcy would not be so easily swept under the carpet, but by the time the news gets out it may be too late. Italian democracy and civil society has been so distorted and abused that it may take decades for the country to return to economic and cultural equilibrium. 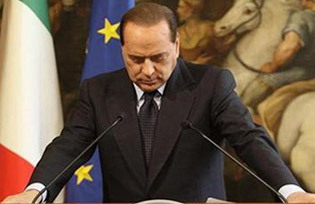 Immediately after Berlusconi presented his letter to the EU outlining how he proposed to solve Italy’s financial woes, the bond markets weighed in against the country, his “rosary of good intentions” as it was described was considered nothing more than a wish list that would never become a reality – that was clear to everyone. Italy is merely contributing to Europe’s slow economic suicide. So the bond markets upped the ante and demanded a yield on Italian 10-year bonds of 6.06%, a record high in the Euro era and some 4% above German 10-year bond yields. It is clear that Italy is now considered a high-risk country. Traders are now fixing a fetish ceiling of 7% for Italian bond yields, a level at which it is thought the Italian government will be unable to pay its dues. Be that as it may, the real problem is the fact that the Italian government has to roll over €290 billion in bonds by the end of 2012 – and at current yields that would be unsustainable. If bond yields stay at 6% this would add €5 billion more to the interest payments the government would need to pay out in 2012. Mario Monti – the white knight? So what do the bond markets want? They want a clear message from Italy on how it plans to fix the economy. This has not been forthcoming – in part because Giulio Tremonti the Finance Minister and Silvio Berlusconi have not even been on speaking terms for some months now. It is now clear to everyone that Berlusconi has to go to be replaced by a government of “Experts” possibly led by Mario Monti, the former EU Commissioner or alternatively by a group of business leaders cobbled together by Luca Cordero di Montezemolo, the Ferrari boss – a less appealing option. The best man for the job was most probably Mario Draghi who was fortuitously awarded the post of President of the European Central Bank – he represented too much of a domestic political threat to Berlusconi. It is unlikely that he would now resign his position to return to save Italy as Prime Minister, most probably because he can do the job more effectively from Frankfurt. Looking at the current trends, the magic 7% level for Italian ten-year bond yields will be reached within days or perhaps weeks and the grim reality of sovereign bankruptcy may eventually force Berlusconi out of a job and into splendid isolation in the Dominican Republic or some other haven of tranquillity. The good news is that Italy is a very wealthy country, also considering the almost 20% of GDP that floats about in the black economy. The regions of Lombardy and Piedmont are together still the wealthiest region in Europe, so all is not lost – yet. As well, the Italian state has substantial holdings in the “national champions” ENI and ENEL, stakes which could be sold to solve the Italian debt problem. The next test will be on 15 November when the Italian Ministry of Finance will try and roll over €9 billion in Btp bonds. Inflation is on the rise, currently at 3.4%, unemployment is officially at 8.3% and 29.3% of young people between the ages of 15 and 24 are unemployed. The global bond markets however, are no longer waiting to see what Italy will do – they are going to make the decision themselves. It is a novel form of regime change but it looks like an effective one.